The Asities are a small group of tiny specialized arboreal passerines found only in Madagascar. They have traditionally been considered one of the five families of birds found only in Madagascar, along with mesites, ground-rollers, cuckoo-roller, and vangas. Recent biochemical evidence (Prum 1993, Moyle et al. 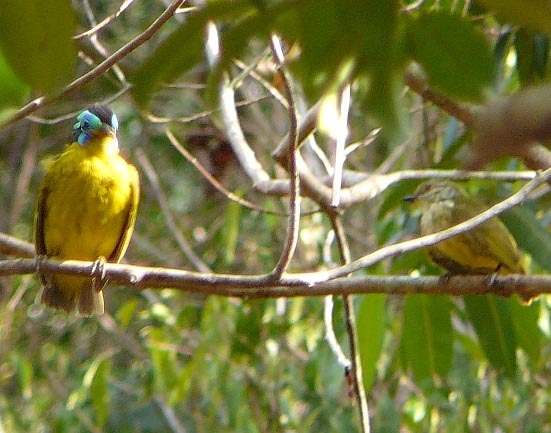 2006) shows that they arose from the same lineage as today's broadbills in Asia and Africa (see below). There are four species of asity, each quite unique. A most prized and local species is Schlegel's Asity (left; photo of a pair © Lois Goldfrank). As can be seen in the photo, males have colorful blue wattles around the eye. All asities are difficult birds to observe and photograph in their rainforest habitat. 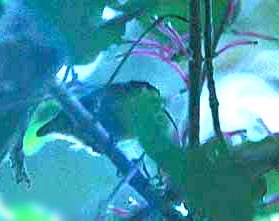 I have taken only a poor and partially blocked shot of a male Sunbird Asity (right) in the subcanopy. Perhaps you can make out its long, thin, decurved bill (recalling sunbirds) and a hint of the bare yellow wattles around its eye. [For great photos of all four asities, see Morris & Hawkins (1998)]. Asities build ragged globular nests which are hung from the tips of branches. Nest construction is apparently only by females who first build a hollow sphere and then poke a hole in the side for an entrance. The male photographed in Ranamanfana Reserve was hanging around such a nest in a social group that included another male, a female, and an immature male. Later, in Perinet Reserve, a local guide took us to an old asity nest that was then being used as day-time sleeping quarters for an Eastern Mouse-Lemur Microcebus murinus smithii who sleepily poked its head out at our approach, gave us a quick look, and retreated back inside. Male Velvet Philepitta castanea and Sunbird Asities engage in wing-fluttering and gape-opening displays, but I have not witnessed those. The two species which I did not see [Schlegel's Asity Philepitta schlegeli and Yellow-bellied (or Small-billed) Asity Neodrepanis hypoxantha] are scarce and local. A fine article on the identification and status of the two species in the genus Neodrepanis is Hawkins et al. (1997). The two Neodrepanis asities are nectarivorous. Schlegel's Asity is more of a frugivore but it, like Neodrepanis, has a brush-tipped tongue. Prum (1993) studied the phylogeny and biogeography of the asities and broadbills and presented evidence that the asities were just a subfamily of broadbills. Moyle et al. (2006) provided much DNA and other evidence that sorted out their true relationships. As it turns out, the broadbill stock arose perhaps 70 million years ago and for some time (perhaps 10 million years) evolved on India when it was still a huge isolated landmass in the Indian Ocean. When India first crashed into the Eurasian continent in the Paleocene, broadbills spread east (to southeast Asia) and west (to Africa) and in that very warm period, likely north as well. As climate cooled, presumably many species became extinct. Broadbills split into two main branches about 55 million years ago. One of those branches included the Eurylaimid Broadbills, the Sapayoa in the New World, and Asities. Sapayoa became isolated at least 52 million years ago. At some point about 35-45 million years ago, the ancestral asity became isolated in Madagascar, where the lineage has evolved ever since. Thus all broadbills, asities, and the Sapayoa, have a common ancestor. One way to look at the evidence is to lump all of them in one huge broadbill assemblage. Another way of handling the exact same evidence is to create four families: the Calyptomenid Broadbills, the Eurylaimid Broadbills, the Asities, and the Sapayoa. To retain Asities as a family, one must make all those splits. Asities have traditionally been considered a family, and the Handbook of the Birds of the World series retained them as a separate family. Making the four-way split, and retaining Asities as a family, is consistent with the way the South American Checklist Committee (and this web site) handled a similar problem with the barbet/toucan assemblage. They either had to be one huge family (including toucans), or five separate families. SACC made the latter choice, and I very much approve. I now handle the broadbill/asity problem in the same way. Photos: The pair of Schlegel's Asity Philepitta schlegeli was photographed by Lois Goldfrank at Ampijoroa, Madagascar, on 9 Nov 2006. The Sunbird Asity Neodrepanis coruscans was photographed in the Ranamanfana Reserve, eastern Madagascar, in Nov 1992. Lambert, Frank, and Martin Woodcock. 1996. Pittas, Broadbills, and Asities. Pica Press, Sussex, England. In the standard format of recent books in the Pica Press series, color plates are found separately (with facing page captions) from the text, giving the feeling this is meant to be a field guide. The quality of the paintings is good, at least to my eye, given my minimal experience in the wild with these great birds but more experience in handling museum specimens. However, not even well-printed plates can capture the glistening colors of these wonderful birds, and the "field guide" poses are stiff and lifeless. The introductory text appears up-to-date, and the species accounts seemed well-researched. I found no obvious errors in the maps or text, but then I know comparatively little about these families. Despite giving the book high marks for apparent accuracy and attractive paintings within the limits of the genre, how I wish for a more "old-fashioned" book on these special families, with full-page spreads of each species in habitat and evocative detail of each species' discovery to science! The "field guide" approach to the art, and the plodding quality of the scientific text, just does not do justice to these marvelous creatures. Yet for what it is, the book is generally well-done and a welcome addition to the bookshelf. Lambert & Woodcock did not anticipate the actual relationships shown by the nuclear DNA research (Moyle et al. 2006), so this fine family book is already outdated on phylogeny and related issues. The Handbook of the World volume covering this family (Hawkins 2003) was, as expected, spectacular. But he also did not anticipate the findings about the true relationships in the broader broadbill group. Hawkins, A.F.A. 2003. Family Philepittidae (Asities) in del Hoyo, J., A. Elliott, & D.A. Christie, eds., Handbook of the Birds of the World, Vol. 8, pp. 94-105. Lynx Edicions, Barcelona. Hawkins, F., R. Safford, W. Duckworth, and M. Evans. 1997. Field identification and status of the sunbird asities Neodrepanis of Madagascar. Bull. African Bird Club 4: 36-41. Moyle, R.G., R.T. Chesser, R.O. Prum, P. Schikler, and J. Cracraft. 2006. Phylogeny and evolutionary history of Old World suboscine birds (Aves: Eurylaimides). Amer. Mus. Novitates 3544: 1-22. Prum, R. O. 1993. Phylogeny, biogeography, and evolution of the broadbills (Eurylaimidae) and asities (Philepittidae) based on morphology. Auk 110: 304-324.